Last week I titled ‘Loanio Launch‘. That was a little premature (I was not the only one fooled by the site apparently going live – see Tom’s blog). Well today Loanio.com is really live. And there are 5 listings at the moment (see screenshot). For a list of features see the previous loanio coverage. Netbanker has a list of states (with max. interest rates), open to Loanio borrowers. You are welcome to discuss your thoughts on Loanio in Wiseclerk’s Loanio Forum. Updated: Just after I wrote this, access to the Loanio website has been restricted again. Finally! After more than a year of anticipation and announcements Loanio has entered the p2p lending stage. When I looked there were no loan listings yet, so let’s have a look on the concept in the meantime. 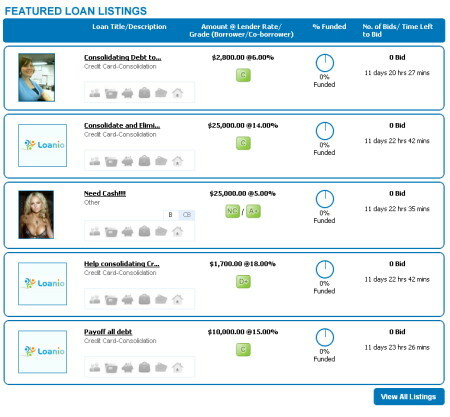 US residents with a VantageScore (Experian) of 569 or with a Co-Borrower with a higher score can borrow at Loanio, provided Loanio is licensed in their state. Currently this is not the case everywhere (e.g. when I looked today, it was not available to California or Florida borrowers). The maximum loan amount is dependant on the state limits (e.g. 25.000 US$ in New York). Terms are 36, 48 or 60 months. Borrowers can repay the loan early without penalties. Borrowers pay a origination fee of 1 to 4% of the loan amount (dependant on credit grade). Borrowers can opt for platinum verification which costs 35-45 US$. If chosen, Loanio verifies photo identification, proof of income, bank account, employment, salary, postal address and homeownership. Second loans are possible if the first loan has been paid at least 6 months on time. The initial interest rate is set by the borrower. If the listing ends with less then 100% but more then 35% funding, the borrower can elect to accept a loan for the funded amount (partial funding). All US residents can lend. Lenders are charged a 1.25% annual servicing fee. Lenders bid at the interest rate they want, lowering the interest of fully funded loans in an auction based style. Co-Borrowers have so far not been used often in peer to peer lending. To make loans to users with lower credit grades more secure for lenders Loanio introduced this feature, which might be used by close relatives or friends of the borrower. Tom reports that Loanio.com will launch this fall. Loanio has a welcome page up since 3 month, collecting email adresses of those who want to be notified at launch. The site Loanio.com currently only consists of an announcement saying “People Lending to People – Coming Soon”. But they are already advertising the site.